Located in the heart of The Triangle development area in the Côte-des-Neiges / Notre-Dame-de-Grâce borough, near the Namur metro. 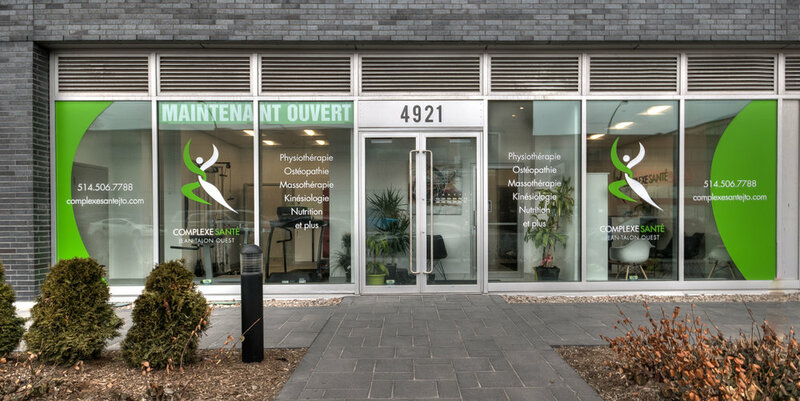 The Complexe Santé Jean-Talon Ouest is a new, modern, multidisciplinary clinic where our healthcare professionals are able to provide a wide variety of specialized services to optimize your overall health. Our mission : Our mission is to optimize the health of our community by offering a unique experience in a relaxing environment and to promote healthy lifestyles so that our community will live longer in good health. The Complexe Santé Jean-Talon Ouest is also proud to contribute to the development of The Triangle district and to be an integral part of the Côte-des-Neiges / Notre-Dame-de-Grâce and Ville Mont-Royal community. Our approach : Our specialized rehabilitation approach includes several steps that will help you regain fitness and improve your health. Our specialized care offered by our highly qualified therapists will help you to recover by prevention, rehabilitation and education. Our approach begins with a detailed assessment of your condition to gather essential data to develop a treatment plan that is customized to your needs and goals. Whether it's for kinesiology, massage therapy, osteopathy, physiotherapy or any other specialized care, our therapists are trained to give you superior treatments. Our healthcare professionals are highly skilled and are constantly up to date in their scientific knowledge. Our combination of manual therapy and various therapeutic modalities will allow you to recover quickly and improve your health. Adequate follow-up and post-treatment management will help you maintain and optimize your health and develop a healthy lifestyle.